Nasi Kak Wok / Nasi Mmanggey is without a doubt one of the best things I have tried so far this year. So when a reader named Wan Rohani Wan Hussin suggested that I try something similar at Warung Soho, we went there immediately on the same day itself. Long story short: it was a satisfying Kelantanese meal which we enjoyed thoroughly. 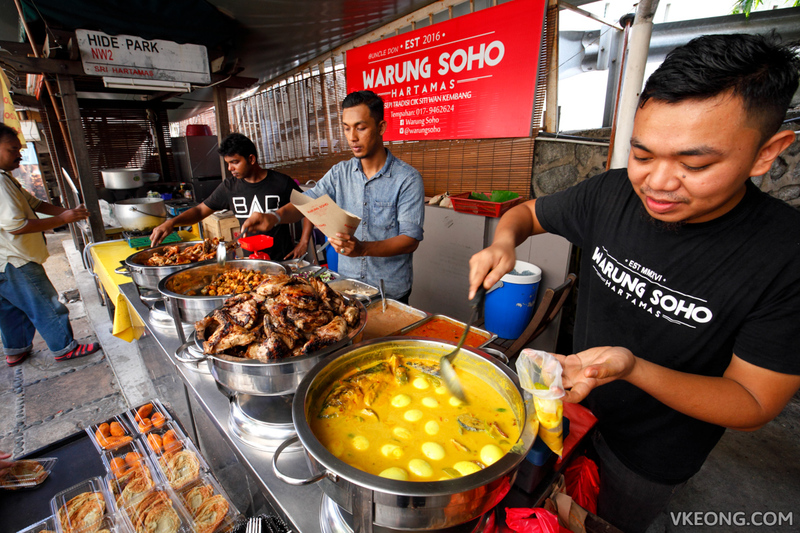 But just so you know, Warung Soho went viral early this year so you might, *just might* encounter queues. Since we dropped by in the afternoon during the fasting month, there were only a handful of customers and most of them were taking away for later consumption. If you looked at the signboard at the back of the stall, you will see the words “Resepi Tradisi Cik Siti Wan Kembang”. I did some research on that on Google and found that a recipe book with the same exact title was published by the Majlis Agama Islam dan Adat Istiadat Melayu Kelantan (MAIK) in 2013. The book features 101 traditional Kelantanese recipes and it is aimed at preserving the state’s culinary heritage. So if I were to make an assumption, whatever Warung Soho is serving, they are prepared according to the book. 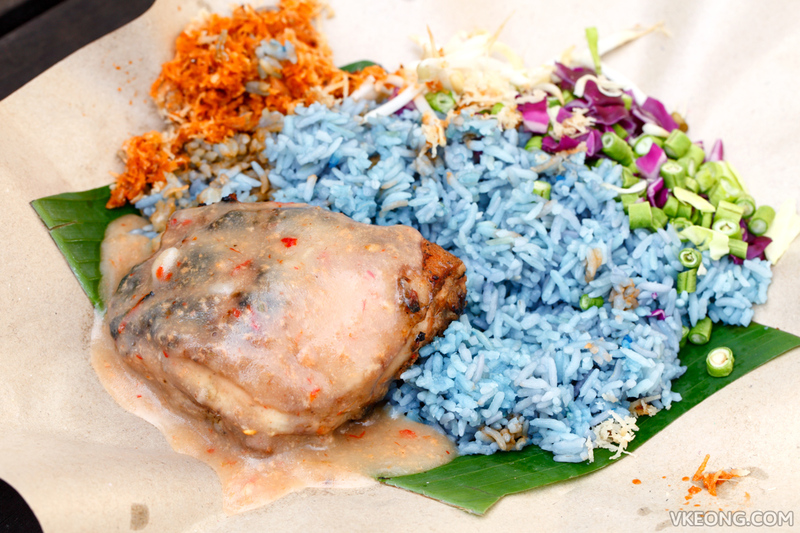 Some of the dishes include Nasi Dagang, Nasi Kerabu, Nasi Soho (their rendition of Nasi Kak Wok), Ayam Percik (shown above), Ayam Kampung, Kambing Bakar, Gulai Ikan Tongkol and many more. But certain items may not be available depending on the time of your visit. During our visit, only Nasi Kerabu and white rice were on the menu. For those who are dining in, the food will be served on a rattan tray lined up with banana leaf. 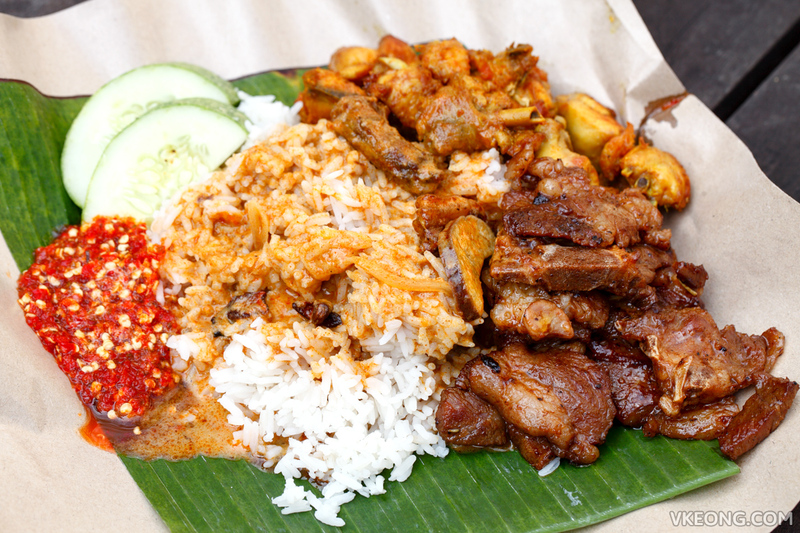 The first thing we had was their Nasi Soho with extra Kambing Bakar @ RM13. This was definitely value for money because the portion can be shared by two. Compared to Warung Cikgu’s, the curry here is sweeter while the chicken is not as juicy and flavorful. Nevertheless it was still delicious and the sambal was spot on. 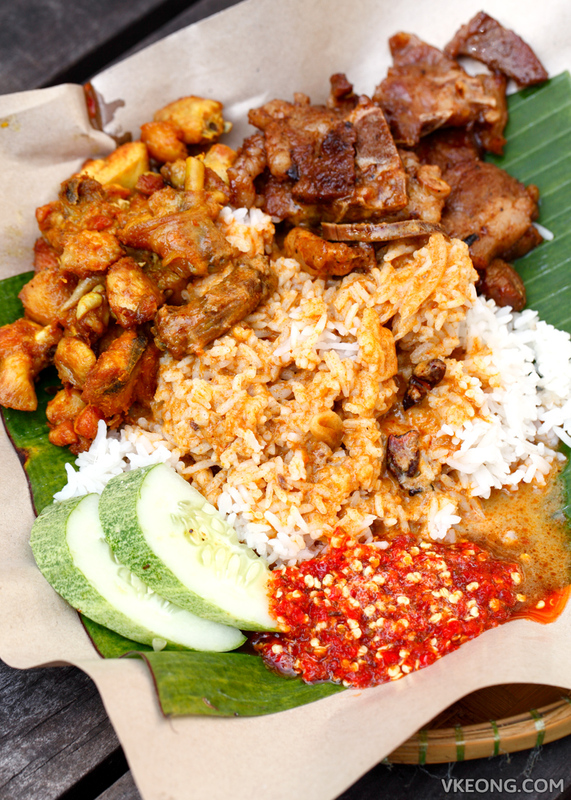 Even if you do not plan on eating Nasi Soho, try the Kambing Bakar. Seriously, it’s freaking good. 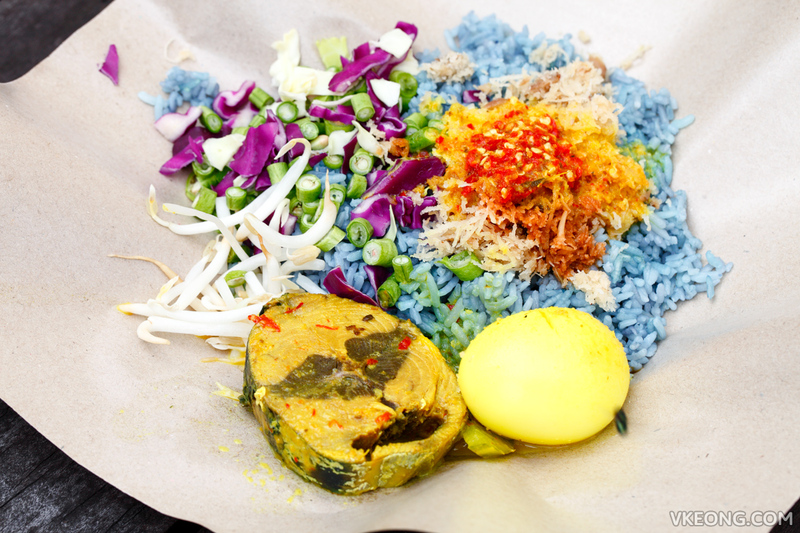 We also had two servings of Nasi Kerabu, one with ayam percik @ RM7 and the other with gulai ikan tongkol and egg @ RM8. You can probably tell from the photo that the rice was cooked with respect to a fluffy perfection. The kerisik and coconut sauce were absolutely delicious as well. More importantly, the rice and curries were still steaming hot so props for freshness. 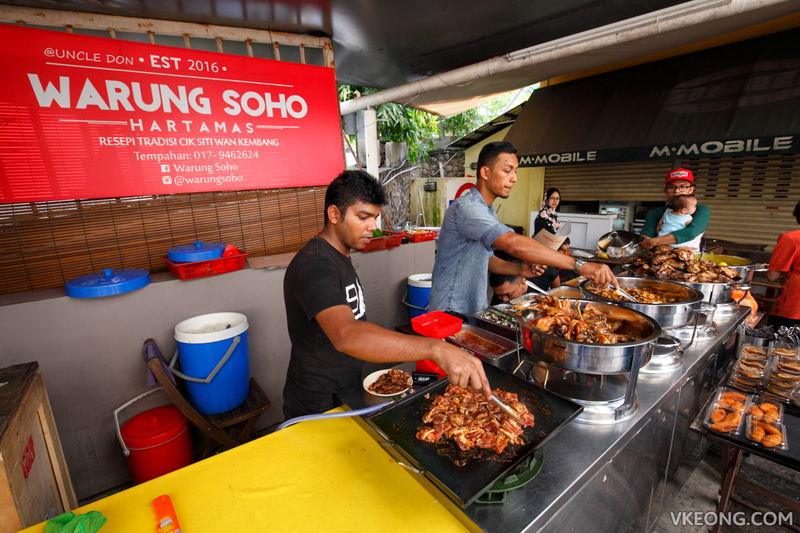 Although we were more than satisfied with the food here, I feel compelled to tell you that Warung Soho was not ready for business when we arrived at the stall. The gist of it was that they announced on Facebook that their revised business hours during Ramadhan month is 3pm to 8pm. However, when we reached at 3.15pm the stall was not even properly setup yet and many dishes were still being cooked. Because of that we spent an extra 45 minutes waiting for them to get the food out out. Luckily the food was above our expectations so the wait was worthwhile. So I guess what I am trying to say is, it doesn’t hurt to come slightly later. Business hours: 10.30am – 4.30pm daily, closed on Fridays. 3pm – 8pm during Ramadhan month. The post Warung Soho Kelantanese Food @ Sri Hartamas appeared first on Malaysia Food & Travel Blog.